When to Open Above Ground Pool? Posted on January 15, 2019 January 14, 2019 , in Above Ground Pools. Every spring, since the dawn of the digital age, search engines around the country are inundated with the question/phrase of “When to open above ground pool?” Even for those who have owned a pool for years, the answer doesn’t seem to get any clearer. For many years now, we’ve seen winter go straight through to summer while completely skipping over spring. So, trying to pick a consistent pool opening date is becoming harder than ever. 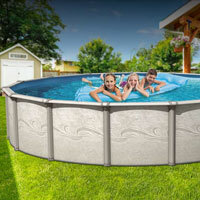 This article will try to give some pointers of when an above ground pool should be opened and why. Can You Pick a Date? As mentioned in the introduction, no longer does it seem possible to pick a specific date in the spring for opening the pool for the season. Winters and springs seem to be getting shorter, but we also know that could change again at any time as well. Rather than choosing a specific pool opening date, a good rule of thumb for the opening of a pool is when you’ve had a week of at least room temperature weather outside. So, once you’ve had a week of 70 degrees Fahrenheit weather, you should be able to be confident in opening the pool. Now some people may argue that just because you have a week of decent weather doesn’t mean that you’ll be able to swim on a daily basis. That may be true, but there are some good arguments for opening the pool anyway. One of these arguments is that it’s much easier to keep your pool clean when it’s actually up and running. With the water circulating through the filters you’ll be able to avoid detritus such as pollen, dust, and algae from building up as the weather yo-yos from warm to cool. If you don’t open your pool early, it’ll just give the water that much more time to collect contaminants and make it harder to get everything in balance once you do get around to opening it. Does It Cost More to Open Early? Some people might argue that it costs too much money to open a pool early. But the fact is that running a pump at low speed when the pool isn’t being used that much because of the weather won’t break the bank. It’ll also lower the costs of chemicals and cleaning that will be required if you allow your pool to sit well into the warmer weather. In the end, the costs will always pretty much balance themselves out. The final argument for opening your pool once the weather hits room temperature is that even if it gets colder, the fact is that it will eventually get warmer. And when it does, your pool will be immediately ready for action. You won’t be slaving away through a heatwave wishing you’d have done all the prep work earlier. So, get out there, get it done and reap the benefits when the time comes. Now that you know how to plan the best time to open your above ground pool for the season, download a buyer’s guide to learn more about the models we have available.